By Liam Kennedy | November 18, 2014. 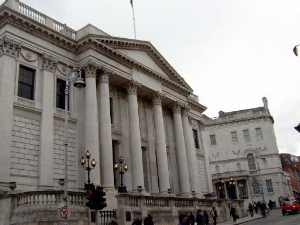 DUBLIN City Council’s €771m budget will see business rates cut by 0.5% and a significant spend in housing. A reduction of 1% had been proposed but the majority of councillors voted for a smaller cut as it would create an extra €1.7m in income. The move comes after Dun Laoghaire Rathdown County Council opted to cut business valuation rates by 2% in their annual budget. Chief Executive Owen Keegan had called for the larger reduction, but an alliance of Sinn Féin, Labour, the Greens and some independents voted in favour of the lower cut. Fine Gael were against it, while Fianna Fáil’s councillors wanted no change in the rates. The extra €1.7m will go largely towards improving streets, with a total of €500,000 allocated for cleaning the streets and a further €400,000 for maintaining footpaths. Another €400,000 will be spent on area offices as well as €200,000 being put aside for preparations for the 1916 centenary. In addition, €100,000 will go towards libraries, whereas the cost of a planning officer and a cycling officer will make up €57,000 and €43,000 respectively. Overall, the Council’s budget for 2015 is a total of €771m and this budget was passed by a vote count of 35 in favour and 27 against. Councillors representing People Before Profit opposed the budget due to the proportion of the money coming from the Local Property Tax. Revenue of around €4.2m will be generated by the tax next year. This takes into account government deductions (which are divided among other local authorities) and a cut of 15% voted for by the council earlier this year. But this surplus will be swallowed up by an almost €60m spend on homeless services in the city. Sinn Féin councillor Ray McHugh, who represents the South Central area of Dublin, believes the rates cut for businesses is a positive steps. A larger reduction, he said, harm business in the city. “My view is that any cut to the commercial rates is a cut to local businesses and services,” he said. The cut in commercial rates comes after Fine Gael senator Catherine Noone called for as much as a 2% lowering of commercial rates, similar to Dun Laoghaire Rathdown. “This money should not be squandered. It should be used to incentivise business and ensure that we have a potentially bigger surplus in 2016,” she said in a statement. “It’s a crazy situation when you have all these people who are homeless and all these houses boarded up. Anything that will go towards helping that situation is a win-win for everyone,” she said. Of the total €771m estimated expenditure, the highest proportions will be spent in the areas of housing and building (€237.29m) and environmental services (€178.11m). As well as this, just over €80m will be allocated for road transportation and safety, and more than €75m will go to water services. This year marked the first time that Sinn Fein voted in favour of the city budget. The party formed an alliance with Labour, Green and Independent Councillors.